We’d love your help. Let us know what’s wrong with this preview of The Sociological Imagination by C. Wright Mills. C. Wright Mills is best remembered for his highly acclaimed work The Sociological Imagination, in which he set forth his views on how social science should be pursued. Hailed upon publication as a cogent and hard-hitting critique, The Sociological Imagination took issue with the ascendant schools of sociology in the United States, calling for a humanist sociology connectin C. Wright Mills is best remembered for his highly acclaimed work The Sociological Imagination, in which he set forth his views on how social science should be pursued. Hailed upon publication as a cogent and hard-hitting critique, The Sociological Imagination took issue with the ascendant schools of sociology in the United States, calling for a humanist sociology connecting the social, personal, and historical dimensions of our lives. The sociological imagination Mills calls for is a sociological vision, a way of looking at the world that can see links between the apparently private problems of the individual and important social issues. To ask other readers questions about The Sociological Imagination, please sign up. So frustrating how we're manage as tumbleweeds (unreasonable and dead-alive) ? I’ve been teaching a first year university subject to student teachers on the sociology of education – I hadn’t realised how much fun I would find the course. It is sort of an opportunity to talk about all of my favourite things. But in the first lesson I had to explain what sociology is and so I talked about the sociological imagination and felt a bit of a fraud, as I hadn’t actually read the book. So, now I have. And it’s a wonderful book. Conveniently, Mills provides his own three-sentence su I’ve been teaching a first year university subject to student teachers on the sociology of education – I hadn’t realised how much fun I would find the course. It is sort of an opportunity to talk about all of my favourite things. But in the first lesson I had to explain what sociology is and so I talked about the sociological imagination and felt a bit of a fraud, as I hadn’t actually read the book. So, now I have. This just needs a very little explanation. Sociology is generally defined as trying to work out where we sit on a particular spectrum. The two ends of that spectrum are not really positions that anyone sensible ever really holds. They are that we are entirely self-made or that we are completely the product of our environment. In Mills’ terms: we are either the product of our biography or of our history. In the West we like to place out bets closer to the self-made end of that spectrum. And we do that despite the evidence, rather than because of it. But if social science is a science – and a lot of this book goes over that dead and sterile debate and so on, but in interesting ways at least – then we expect sciences to have both theories and methods. Mills doesn’t say ‘have no theories’ but rather that we shouldn’t trust grand theories that provide too many answers. Mills is more of a questions, than an answers sort of guy – best to be one of those if you possibly can – and so a lot of this book is devoted to looking at the kinds of questions sociology ought to ask and some of the ways that it might be worthwhile seeking out answers to those questions. What I like most about him is he goes out of his way to be as clear as possible – something that academics and academic writing often tries to avoid as if on pain of death. He says that too much of sociology is three hundred page books that could comfortably have had everything important in them said in thirty pages. That this is also true of some of the research that is done – that is too grandiose and not at all clear about what it is seeking to answer (or why) and so stumbles and trips if never actually seeming to fall on its face - although a lot of it is so unclearly written that it could fall on its face and no one might notice. The lessons here are to be clear about what it is you want to answer, lay traps for yourself so you don’t just end up echoing the obvious in ways no one can understand, avoid echoing The power, and learn the craft – that being good at the craft is the path to success in this science. I really like sociology. I think there are too many things in life we take for granted – a similar idea to Socrates’ one of the unexamined life – and that there are relatively simple methods to ‘interrogate’ the world with that illuminate aspects of our world in surprising ways – particularly around the big three major themes of race, gender and class – themes that we just wouldn’t see otherwise. C. Wright Mills, ABD akademisinin yalnız muhaliflerinden. 45 senelik kısa ömrüne Türkçede İktidar Seçkinleri ve Toplumbilimsel Düşün olarak bilinen sosyal bilimler kitaplarının yanısıra, Dinle Yankee gibi bir anti-emperyalist metni de sığdırmış. Uzun yıllar kendi halinde çalışmalar yaptıktan sonra, Küba Devrimi belli ki onu siyasi hayatta daha aktif olmaya itmiş. Hayatını sonlandıran kalp krizi de, katıldığı bir tartışma programında, emperyalizmin Latin Amerika politikasını eleştirdiği bir sırad C. Wright Mills, ABD akademisinin yalnız muhaliflerinden. 45 senelik kısa ömrüne Türkçede İktidar Seçkinleri ve Toplumbilimsel Düşün olarak bilinen sosyal bilimler kitaplarının yanısıra, Dinle Yankee gibi bir anti-emperyalist metni de sığdırmış. Uzun yıllar kendi halinde çalışmalar yaptıktan sonra, Küba Devrimi belli ki onu siyasi hayatta daha aktif olmaya itmiş. Hayatını sonlandıran kalp krizi de, katıldığı bir tartışma programında, emperyalizmin Latin Amerika politikasını eleştirdiği bir sırada bulmuş onu. Sociological Imagination, Mills'in "İyi bir sosyal bilimci nasıl olmalı?" sorusuna verdiği yanıtlardan oluşuyor. Yazılmasının üzerinden neredeyse 60 yıl geçmiş ve bu süreçte akademi alanında önemli değişiklikler gerçekleşmiş olmasına rağmen, Mills'in sunduğu perspektifin temel unsurları hala geçerliliğini koruyor. 1. Çağımızda insanların yaşadığı sorunların bireyselleştirilmesine karşı, bu sorunların ardındaki toplumsal mekanizmaları çözmek önemli. Bu da ancak incelenen toplumun yapısını çözümleyerek mümkün olur. 2. Sosyal bilimci, teoriler ve yöntemler üzerine düşünürken aşırıya kaçmamalıdır. Sosyal bilimcinin asıl sorunu bunlar değil, çağının insanlık açısından en önemli çelişkileridir. Sosyal bilimci, teorisini ve yöntemlerini, çağının bu çelişkilerini tespit etme, onları unsurlarına ayırma ve çözümler önerme süreci içerisinde mükemmelleştirir. 3. Cilalı sosyal bilim jargonu, küçük-burjuva akademisyenin arkasına saklandığı duvardır. Bilimselliğe değil, akademisyenin statüye duyduğu arzuya işaret eder. Oysa bir sosyal bilimci kendini toplumsal mücadelelerden ne kadar uzak tutarsa tutsun, yaptığı ve söylediği her şey zorunlu olarak, onun isteğinden bağımsız olarak bu mücadelede bir yer işgal eder. 4. Bu nedenle, sosyal bilimci alanın jargonuyla, süslü kavramlarıyla aşk yaşamaz. Sosyal bilim jargonu, ancak o kavramı kullanmak gerçekten algılarımızı etkiliyor, akıl yürütmemizi derinleştiriyorsa kullanılmalıdır. 5. Akademide var olan sosyoloji, psikoloji, tarih, ekonomi, antropoloji, felsefe uzmanlaşmaları yapay ve tesadüfidir. İyi bir sosyal bilimci bu yapay bölünmelerin kölesi olmaz. Yapay uzmanlıklar geliştirmez. O üzerine eğildiği sorunun uzmanıdır ve bunun için tüm alanlardan bir şeyler öğrenir. Mills'in kitaba ek yaptığı son bölüm, her sosyal bilimci tarafından mutlaka okunması gereken bir makale: "Intellectual Craftsmanship". Mills burada iyi bir sosyal bilimcinin kendini nasıl yetiştirebileceğine, gelişimini nasıl takip edebileceğine dair çok güzel öneriler sunuyor. Mills'in zaaflı gördüğüm yanları da yok değil. Bunlar içerisinden en önemlisi, kendi yalnız, başına buyruk ama siyaseten "kaygılı" küçük-burjuva akademisyen tavrını, tavırların en iyisi olarak göstermesi. Ona göre ideal akademisyen tipi, bağımsız çalışan, araştırma konularına kendi karar veren ama çalışmalarını daha anlaşılabilir kılarak, kamuya da ulaşmayı hedefleyen akademisyen. Oysa bu örgütsüz akademisyen tavrı, Mills'in kitap boyunca eleştirdiği tavra çok benziyor. The first 100 pages of this book were really hard to get through, and even after that, the book was very dense and took quite a bit of effort to understand. All that being said, this has been one of the most thought-provoking and academically-inspiring books I have read in the past year. Mills was a prominent sociologist of the earlier half of the twentieth century (if I’m not mistaken, he coined the phrases “WASP” and “white collar”). In this book, Mills criticizes the two dominant methods of s The first 100 pages of this book were really hard to get through, and even after that, the book was very dense and took quite a bit of effort to understand. All that being said, this has been one of the most thought-provoking and academically-inspiring books I have read in the past year. Mills was a prominent sociologist of the earlier half of the twentieth century (if I’m not mistaken, he coined the phrases “WASP” and “white collar”). In this book, Mills criticizes the two dominant methods of studying sociology (grand theory and abstracted empiricism), and then goes on to delineate the sociological imagination—a way of studying society that factors in historical, political and individual factors, that does not get too lofty with grandiose theories and abstractions nor too mired in the numbers and statistics of abstracted empiricism. He then writes about the need for the sociological imagination in today’s society, in relation to our reason and freedom, our democracy and politics. The appendix provides some guidance on how to conduct such research. Though Mill had a few touches of elitism to him, it was so refreshing to read someone who had a vision for social sciences (and for the academy) that mandates relevance to society at large and the individual. There's a scene early in Crime of Passion (1957, Barbara Stanwyck, Sterling Hayden, Raymond Burr) when a newspaper advice columnist named Kathy (Stanwyck), a self-confident, independent, unmarried dame, is trying to cover a story about a woman who has killed her husband. A police chief comes into the press room and Kathy tries to get some information out of him. He says, "What are you doing here? You should be at home with your children, cooking your husband dinner." Sadly, Kathy does not at that point reach down and twist his testicles in a full circle while pushing a stapler up his nose. In fact, she says nothing, preferring to avenge herself in a sneakier manner. But the line went into me like a knife, and so it is with The Sociological Imagination. Though I'm guessing Mills was unaware of what he was doing, in these mid-century books the world consists only of men (and one mention of Karen Horney). Only men are doing the important things, becoming sociologists, becoming academics, studying the bureaucratic ethos, researching Weber and Parsons and Veblen, earning salaries. Any woman who was able not just to exist in a world like this but to get an advanced education, have a career, succeed in a profession, ignoring all the language around her referring to men, men, men, men, a man, a man, a man, a man - language which says "this world is not for you" - my hat is off to her. Sometimes commentators many years after a book is published will note such sexist language ruefully, but Todd Gitlin in his Afterword seems oblivious to it. The first chapter is what is most often read and/or assigned, but I think it continues to be one of the best statements defining sociology and a sociological perspective. The other chapters on grand theory, etc. are also worth reading, but the first chapter 'The Promise' is perhaps the most important and also mostly commonly cited by contemporary sociologists. Mills' description of the way in which Americans tend to perceive problems as emanating from the individual - rather than considering larg The first chapter is what is most often read and/or assigned, but I think it continues to be one of the best statements defining sociology and a sociological perspective. Mills' description of the way in which Americans tend to perceive problems as emanating from the individual - rather than considering larger, structural forces at play - captures the predominance of reductionist thinking in American society. من أهم المبادئ التي تعلمتها في الجامعة عن المجتمع ومشاكله..
حتى أنني لا أنفك أتكلم عن هذا المبدأ في أوراقي البحثية كما سأكتب عنها في رسالتي للماستر..
يؤصل الكاتب لهذا المصطلح من خلال بعض الأمثلة كما التحليل الفلسفي..
المخيلة الاجتماعية هي ببساطة تلك القدرة عند المجتمع وأفراده على رؤية نفسهم كمجتمع له مستقبل.. This book is written as a sort of textbook for aspiring sociology majors, although Mills wouldn't like the term "textbook". He spends the beginning of the book fairly aggressively attacking current (in the 50s but still I think quite relevant today) trends in sociology and then goes on to explain sociology as he sees it: a neccesarily political and historical profession. Though I wouldn't recommend it to everyone and it's certainly not light reading, it provides an excellent toolkit for starting This book is written as a sort of textbook for aspiring sociology majors, although Mills wouldn't like the term "textbook". He spends the beginning of the book fairly aggressively attacking current (in the 50s but still I think quite relevant today) trends in sociology and then goes on to explain sociology as he sees it: a neccesarily political and historical profession. Think of this as a manifesto for the social sciences. Its key points: think critically, always consider ideological implications, and think holistically but pay close attention to the evidence. Mills was a remarkable thinker, and he shows why the social sciences have something to say about the world we live in. And, unlike many of his fellow Marxist writers, he has no patience for jargon or obscurantism. It's a clarion call for action that retains all of its power to this day. Compulsory reading for my summer university paper but a genuinely great book. Nothing groundbreaking (for me) but definitely reinforces that I’m looking at the world through the right lens. I'm writing a paper for the New York State Sociological Association and am going to use Mills as one piece of my theoretical foundation. His book is a pretty interesting look at sociology that matters and tries to make change as well as the interplay that happens between the individual (biographical) and the societal (historical) when making change. It also has some interesting parallels with journalism that I want to explore further. For instance, Mills talks about sociologists who have become I'm writing a paper for the New York State Sociological Association and am going to use Mills as one piece of my theoretical foundation. His book is a pretty interesting look at sociology that matters and tries to make change as well as the interplay that happens between the individual (biographical) and the societal (historical) when making change. It also has some interesting parallels with journalism that I want to explore further. 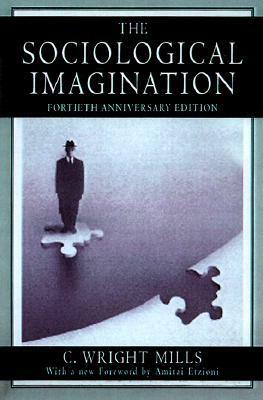 The Sociological Imagination is a usefull book to read for every one that like to underestand Social and Political relations. Specially inequality in human relations explained well. I enjoied of reading this book. A must read for sociology student. A pretty outdated, but decent explanation of what sociology is, how an ideal sociologist ought to go about research and the ideals they should hold. Whilst this book's general thesis is fantastic, the examples are largely outdated, the book is pretty dry and the book offers very little to somebody who has already studied sociology. Whilst the book itself is about 2 stars, the appendix is 5. The appendix 'On Intellectual Craftsmanship' is a fantastic outline of how a sociologist or student of any A pretty outdated, but decent explanation of what sociology is, how an ideal sociologist ought to go about research and the ideals they should hold. This book came recommended to me by a much-loved professor from undergrad, and I finally got around to reading it. Published in 1959, this book seeks to call sociologists to action. While his contemporaries mired themselves in grand theory or abstracted empirical study, Mills argues for a sociology that takes its political job seriously. Rather than submitting to the will of the powerful, Mills argues that sociologists have a duty to inspire their students to think more critically and to really t This book came recommended to me by a much-loved professor from undergrad, and I finally got around to reading it. Published in 1959, this book seeks to call sociologists to action. While his contemporaries mired themselves in grand theory or abstracted empirical study, Mills argues for a sociology that takes its political job seriously. Rather than submitting to the will of the powerful, Mills argues that sociologists have a duty to inspire their students to think more critically and to really take a hard look at the social structure. Un clásico. Fue determinante en mi rumbo inicial como sociólogo, gracias a su inclusión en el programa de la materia por el profesor Rinesi. Recuerdo el prólogo de Germani, en el que ubica a Wright Mills en el contexto norteamericano, dice "está muy bien para EEUU, pero acá en Argentina hace falta burocracia primero". Read in part for CRM3301 (Contemporary critical theories in criminology) and other sociology classes. Any one who fancies themselves a social scientist should read this book. Mills provides the basis for any good social research. It's an interesting book but hard to understand. Very smart. But very hard to read for somebody.. like myself.. who is a new student. Will have to come back to this in a few years. Not that I completely agree with everything in this book, but Mills definitely challenged my ideas on how the social sciences should be approached. Interesting stuff! I think its cool when you read a book that is 40+ years old, but it has weird little hints and general information that informs a lot of the weird changes you have experienced in the present. The first hundred or so pages deal with abstract sociological theory that C. Wright Mills argues are missing the forest for the trees. He posits two then-popular modes of thought, which were abstract empiricism and the grand theory. His arguments against these modes of thought make sense: for example, there can't be a grand theory of sociology because, cliched as it seems, every person is different and unique. Every person is, thus, mutable. To generalize a group of people and state a theory as The first hundred or so pages deal with abstract sociological theory that C. Wright Mills argues are missing the forest for the trees. He posits two then-popular modes of thought, which were abstract empiricism and the grand theory. His arguments against these modes of thought make sense: for example, there can't be a grand theory of sociology because, cliched as it seems, every person is different and unique. Every person is, thus, mutable. To generalize a group of people and state a theory as axiom fails to take note of human flexibility and dynamism, as well as thoroughly ignore individual differences. This is one of the best known works of sociology and the highlight of Mills' impressive career. I've seen excerpts from Chapter 1 (An inspirational essay on "The Promise" of sociology) and the Appendix (A student's guide to the dos and don'ts and the author's helpful suggestions "On Intellectual Craftsmanship") in various introductory classes, course packets, and textbook anthologies of selected readings. Between the oft-referenced first and last sections lay a scathing critique and intelligent t This is one of the best known works of sociology and the highlight of Mills' impressive career. I've seen excerpts from Chapter 1 (An inspirational essay on "The Promise" of sociology) and the Appendix (A student's guide to the dos and don'ts and the author's helpful suggestions "On Intellectual Craftsmanship") in various introductory classes, course packets, and textbook anthologies of selected readings. Between the oft-referenced first and last sections lay a scathing critique and intelligent treatise on the contemporary (and I might even suggest current) state of the social sciences. His conception of the "Sociological Imagination" is more than a buzzword; it is a vehicle to a much broader but still realistic understanding of WHAT exactly the problems of society are and HOW we may go about studying them. Mills lambasts the two extremes of Grand Theory's untestable and overly-syntactic nebulousness, and Abstract Empiricism's unquestioning analyses of abstract and subjective data and its unhealthy preoccupation with methodology. He accuses researchers of too often bending to the biases of the institutions of which they are a part, or, perhaps more grievously, to those supplying the money. This has led to a bureaucratization of the research process and enables the growth of ideological cliques, robbing the social sciences of their cherished spirit of free inquiry. What social science truly boils down to, Mills argues, is the study of "the human variety, which consists of all the social worlds in which men have lived, are living, and might live". We cannot do this without considering the social structures that compose these social worlds, or more broadly, the relationships and patterns of interaction that define them. We must also consider history--our modern-day social milieux and social problems didn't just come out of nowhere, and it's entirely possible that they developed and/or existed in a different form in another time and another place. Curiously, Mills himself is aware that contemporary society is changing ("We are at the ending of what is called The Modern Age... [which] is being succeeded by a post-modern period") and has much to say on where he perceives our concerns and values shifting. American sociologist. Mills is best remembered for his 1959 book The Sociological Imagination in which he lays out a view of the proper relationship between biography and history, theory and method in sociological scholarship. He is also known for studying the structures of power and class in the U.S. in his book The Power Elite. Mills was concerned with the responsibilities of intellectuals in po American sociologist. Mills is best remembered for his 1959 book The Sociological Imagination in which he lays out a view of the proper relationship between biography and history, theory and method in sociological scholarship. He is also known for studying the structures of power and class in the U.S. in his book The Power Elite. Mills was concerned with the responsibilities of intellectuals in post-World War II society, and advocated public, political engagement over uninterested observation.